Welcome to my first What’s Cooking? Wednesday post (on a Saturday). Yep, I’m that behind. This week did not go as planned at all. I’m a bit late on all my post for the week so I’m gonna work on them as I can. Let’s get on with it! Your first step is to mix the tomato paste, cumin, oregano, garlic, salt, and pepper in a bowl and set aside. Heat your sauce pan over medium heat and add your oil, flour, and chili powder. Stir to combine. Heat until mixture is thick, stirring to keep from burning. Slowly add chicken broth while while whisking to dissolve flour mixture. Reduce heat to simmer. Cook 10 minutes then remove to cool. note I used a gluten free flour mixture but that is not necessary if you do not need to go GF. I also used a preminced garlic that had oil in it so I reduced my oil down to 2 tablespoons. 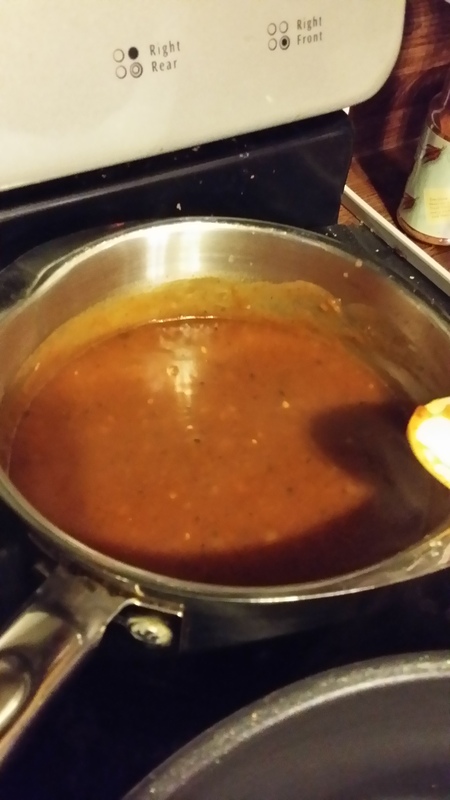 Here is how the sauce looks. While the sauce is cooking, preheat oven to 400 degrees. Lightly oil (or spray) a 9 x 13 pan. Heat oil in saute pan over medium heat. Add onion and garlic. Cook until translucent and soft. Add turkey to the pan. Brown slightly then add seasonings. Continue to cook until turkey is cooked through. Add 1 cup sauce. Reduce heat to low and simmer until reduced. Now to put them together. Spoon 1 cup of sauce into bottom of pan. 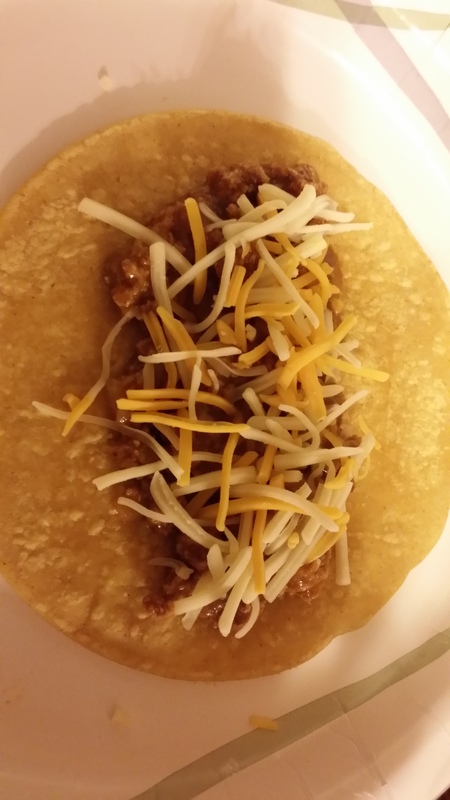 Place a 1/2 cup of meat onto the center of the tortilla. Fold the 2 sides in and place seam side down into the pan. Repeat until the pan is full. Pour remaining sauce on top and then sprinkle cheese over them. Cover pan with foil and cook for 10 minutes. Remove foil and cook another 5-10 minutes. I forgot to take a picture of them when they came out of the oven. We were so hungry from smelling them that we just sat right down to eat. 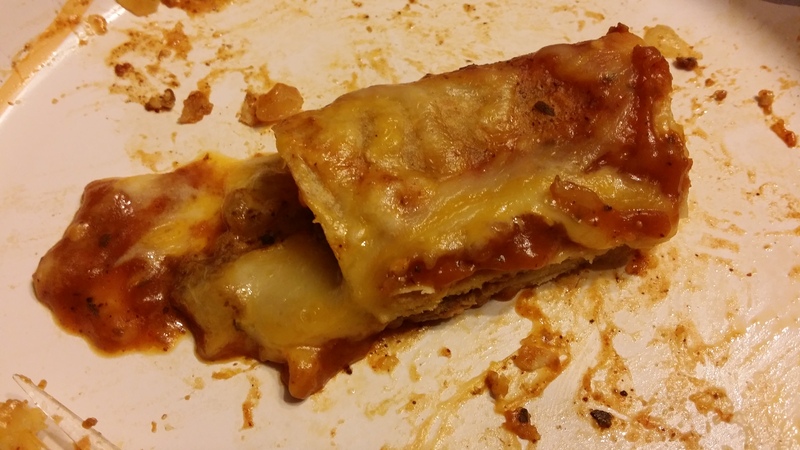 I did manage to get a picture of part of the last enchilada before someone grabbed it. I did all my prep together at time of cooking. I think it would be easier to prep some ahead of cook day. Yes. We will be adding this to our monthly rotation. It was super yummy. I liked them just the way they came out. However, my husband and middle son both said they wanted a bit of extra heat. I found that odd since my husband hates spicy food. 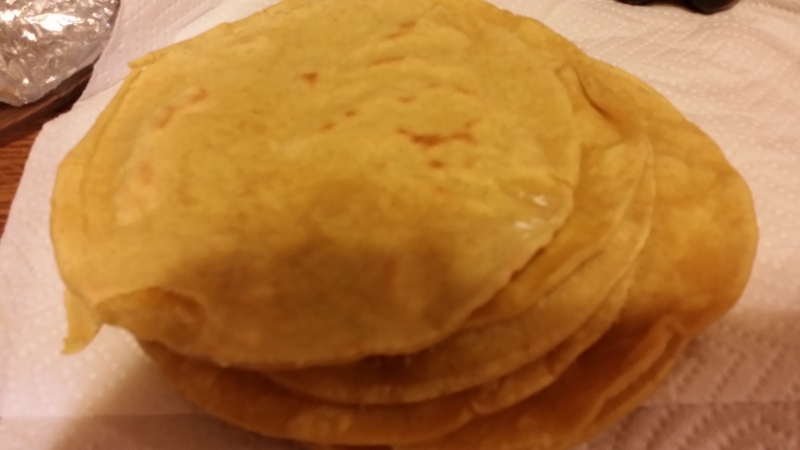 Hubby also requested that I use flour tortillas. So what I might do is a pan of flour tortillas and a pan of corn tortillas. Then I could freeze the leftovers and have a whole meal just from the two pans. If you would like to make these a bit less time consuming, here are some suggestions. Buy jarred enchilada sauce. The sauce itself doesn’t take long to make. You could make a batch and freeze or can it for later use. 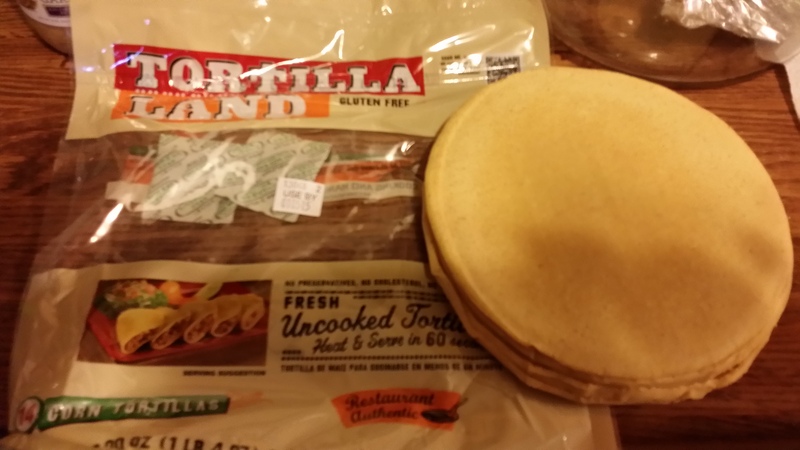 As mentioned above, you could buy the already cooked tortillas. No cooking or heating required. I will be making the sauce in advance and depending on how long before making them, it will either be placed in the fridge or frozen. Pre-cutting the onions and mixing the spices before hand should help too. Of course, if you do once a month cooking, you fix the whole dish ahead of time and freeze it. Please visit The Fresh 20 at http://www.thefresh20.com and check out the wonderful menu options as well as their pricing. Try a menu for free!